I almost forgot that I made this dress! It was about a month ago during a mini heat wave we had here on California's Central Coast. That was the last time we had any heat or sun. I've been wearing my winter wardrobe ever since. Not that I mind, it's my favorite type of clothing. 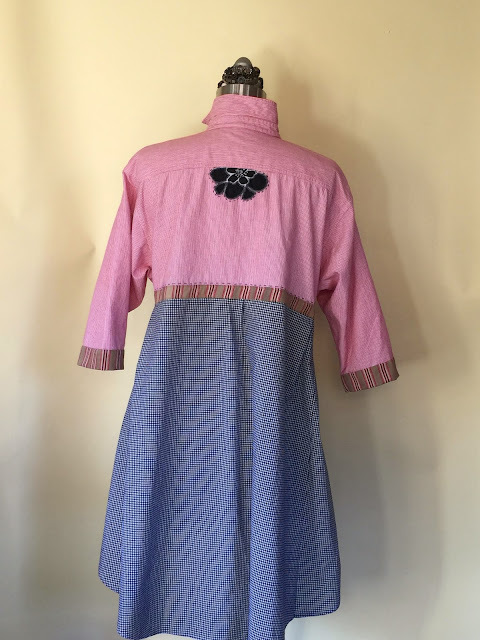 The pattern is Marcy Tilton's Little French Housedress. I think I've made 4 or 5. I wear them with leggings. The fabric is from Marcy's collection. 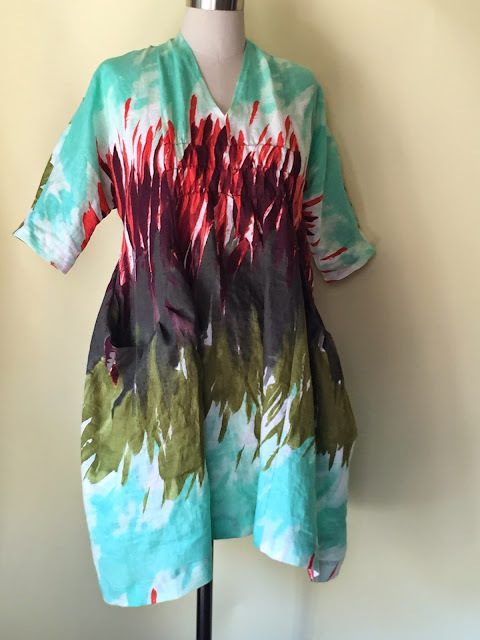 It's a lightweight linen with a very pronounced print...yes, I'm still trying to work through all those prints I bought. This was difficult to lay out. I couldn't figure out how the print should be placed. In the end I had just enough fabric to make it work this way...and only this way. Took at least twice as long to lay out as it did to sew it! I'm working on several jewelry projects and have drafted a tunic from a ready-to-wear garment that I've made a wearable muslin from. I've just gotta get them photographed and then I'll show you. I've made many tops out of thrift store men's shirts. They are always fun because it's an art project. The garments evolve like a painting or sculpture would. 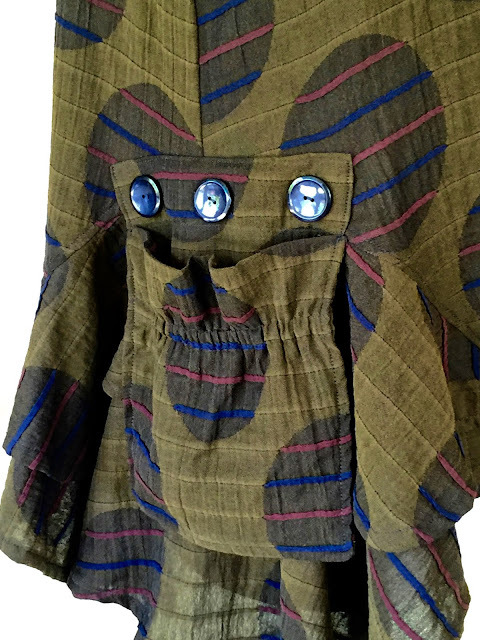 I wanted to try one of Michelle Paganini's patterns for designing this type of shirt. It's always instructive and interesting to see how someone else would approach a technique. She has three shirt patterns with another for a flower brooch that are available on her Etsy page under her company name, Paganoonoo. They are designed to be a blueprint for how to construct a shirt using three men's shirts. 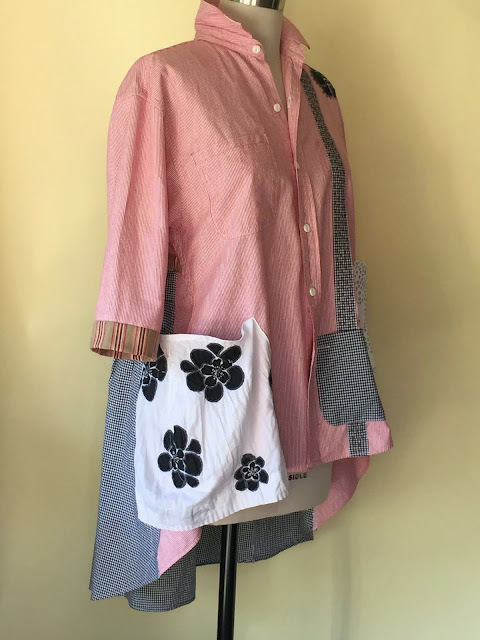 There's plenty of leeway to change them and create what you want or you can follow the directions to the letter which makes these patterns useful for both beginners and those who have done some "re-shirting" before. With this shirt it took me about 10 days to get what I wanted. Slow sewing...good...I have enough clothes as it is, I don't need to whip out garments in a day anymore! Here's how I approached it. I used two shirts; a piece of vintage French ticking I got at the Paris flea market (the brown stripe) and a snippet of an old shirt with white and black flowers which I used for a pocket and a couple of single appliqués. Notice the pocket is free hanging on the bottom since it comes down farther than the hem. I needed a bottom to the pocket but also wanted to use all of this fabric and liked the idea of an asymmetrical hem. I solved that problem by inserting an inner pocket hidden under the one that shows. I used a pocket from one of the shirts. So, it looks like a huge pocket but is actually much smaller. You might catch a glimpse of another pocket on the front that I didn't show. It's set higher than the one in the photo. I like the way it looks on but didn't like any of the photos. I made it from a piece of fabric I got from Marcy Tilton. It's white cotton with holes in it that are outlined in black. Finally, I did some hand stitching with Pearl Cotton. I'll wear this a couple of times then I might add a bit more stitching. This was a fun make! I'm loving this self drafted pattern. 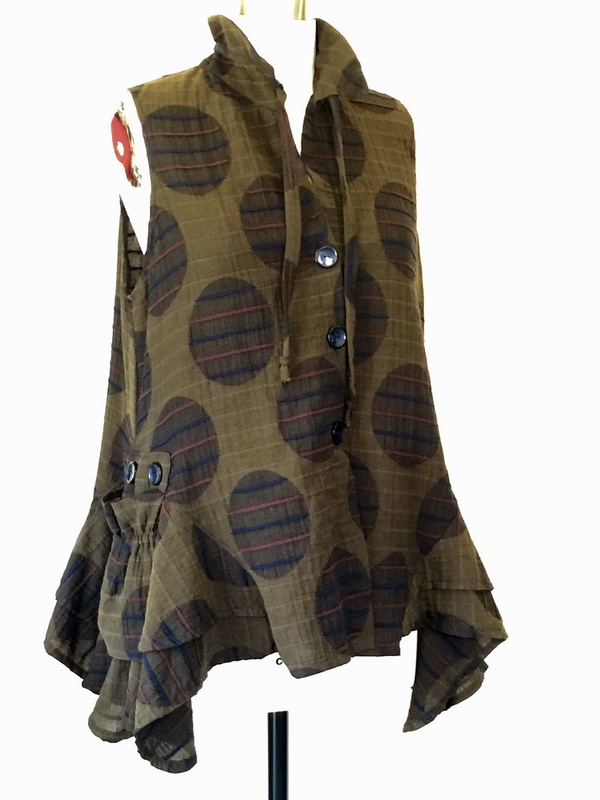 This vest is very wearable...meaning I'm wearing it twice or three times a week right now! The fabric is a textural woven from Japan (I believe). A friend gave it to me after I saw Sham's jacket made with the same fabric. Japanese textiles make everything look good! I'm still loving the pocket. I use pockets all the time instead of a purse. But, I'll have to curb my habit of walking around with my hands in my pockets because I just heard that those of us older than 60 shouldn't walk with their hands in their pockets. The doctor who leads our local brain trauma clinic says that he sees 10 cases a month (!) having to do with people who fell while their hands were in their pockets! Yikes! On a happier note...here's what Joe and I had for dinner last night. We cooked together! 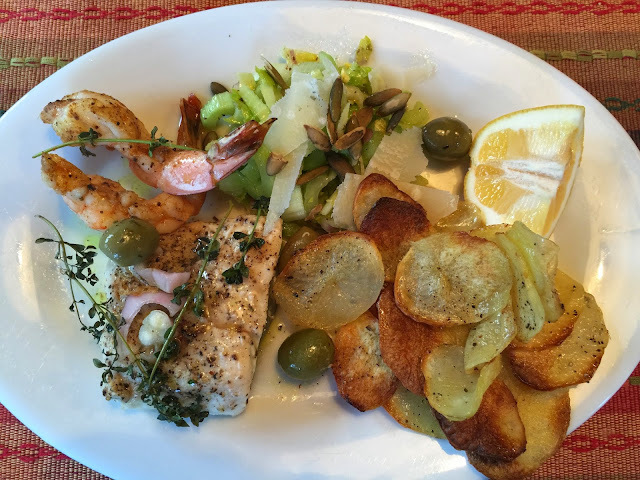 Halibut and shrimp roasted in parchment with thyme, green olives and lemon; oven roasted Yukon Gold potatoes and celery salad with parmesan and Pepitas. Life is good.